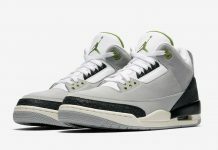 1988 – Michael Jordan wears the Air Jordan 3 in the Slam Dunk contest against Dominique Wilkins and sure enough, MJ takes the title home for the 2nd time. 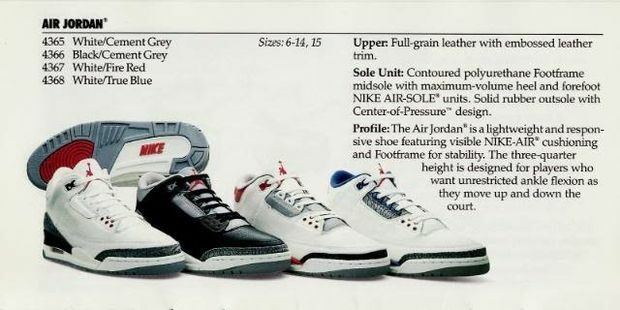 Here’s a look at the original Air Jordan 3 catalog from 1988 showcasing all four original colorways of the Air Jordan 3. 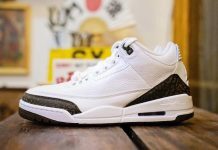 The line up included the Air Jordan 3 White / Cement, Black / Cement, Fire Red and True Blue in it’s purest form. Notice the thin Cement on the toe box and the description. Man how times have changed. Do you own a pair? Let us know. 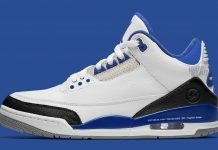 I wish they would make shoes like this again. What I mean is, EXACTLY like these!